Our range of products include fermentation tank and production vessel. 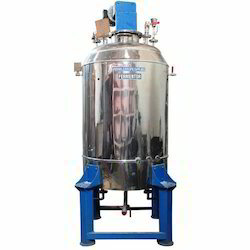 We are the manufacturers, suppliers and Exporters of Fermentation tank in India. We supply Fermentation Tank made of stainless steel 304 / 316 grade with agitators fixed on top of the lid. The stainless steel lid provides ports for Media, Culture, and Water and holds Pressure gauge. The agitation supported by stainless steel shaft with cross blades. Steam generator sterilizes the whole unit and is made of stainless steel / Mild steel, depending upon customer’s choice. We are the manufacturers, suppliers and Exporters of Production Vessel in India.We offer Production vessel designed by experts with high experience in the field of production vessel manufacturing. We manufacture production vessels with varying capacities ranging from 10 Liters to 10,000 Liters. Our production vessels play an immense role in production process of various industries across India. Our specification suits for production of various Bio-active compounds in small scale as well as in large scale. 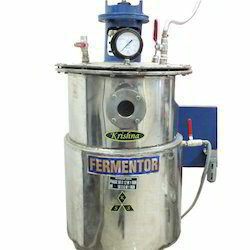 Looking for Fermenter Tank ?